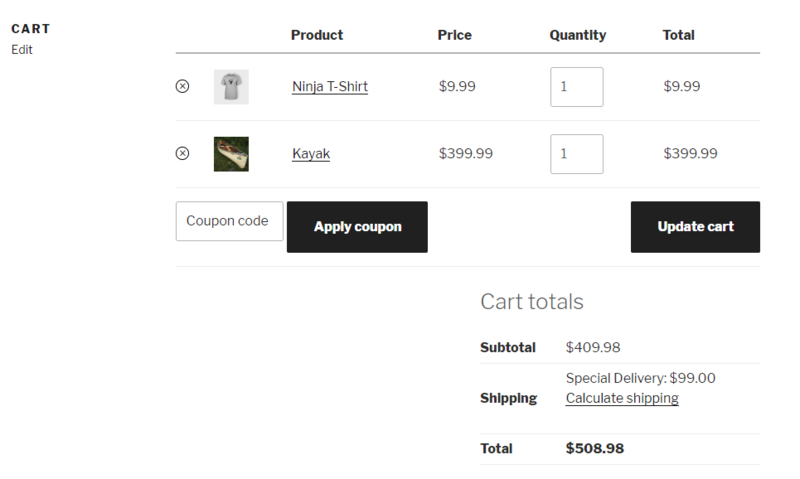 This plugin allows you to define complex shipping rules that will allow you to ship your product all over the world using the correct shipping cost. Once you have uploaded the plugin click “Activate Plugin” and you are all set! The first thing you need to do is spend some time thinking about what you want your shipping rules to look like. A little time spent now will make the whole process incredibly smooth and simple! To create your rules, the plugin uses shipping classes, shipping services and shipping zones. Think about what you are trying to achieve and make a note of the rules on a piece of paper, spreadsheet or anywhere handy. So as you plan your shipping rules think carefully about the different geographic regions you would like. Maybe you are very simple and only ship to one country, maybe you have more complex needs and want to create a region for specific zip/post codes. This will take you to the screen where you can now start creating the various shipping methods. A shipping method is an actual type of shipping. For example you might have “Standard”, “2 Day”, “Overnight” or a 3rd party like “DHL” or “UPS”. In this example I’ll use “Standard”. Click the “Add new” link to create a new shipping method. Now you will see the screen that lets you setup the rules & rates for this shipping method. This is the main part of setting up the shipping. We’ll go through and discuss each of these settings. This simply enables or disables this method. This is useful while you are testing different shipping methods, or you run a shipping special that you only want to turn on occasionally. 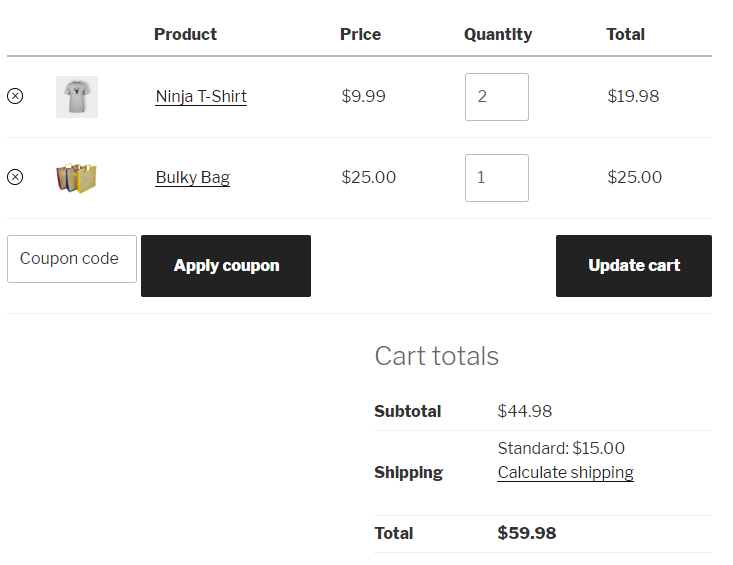 Sum of all applicable rules: add together all the shipping values returned for each item in your cart. For example one item might match one rule and produce a value of $5, another item might match a different rule and produce a value of $2. If you you select the “sum” option the total shipping would be $7 in this case. Use highest shipping cost: if you select this mode the plugin will select the LARGEST value. So using the items form #1 above, selecting “Highest” would make the shipping $5, as $5 is the highest value calculated for any one rule. These are the main rules that control how the shipping charge is calculated. Before we go any further let’s go over how the rules are actually matched. The way the plugin works is a follows. Once it has matched a shipping zone, it will get all the shipping methods for that zone that you have set up (say “Standard” and “Express”). 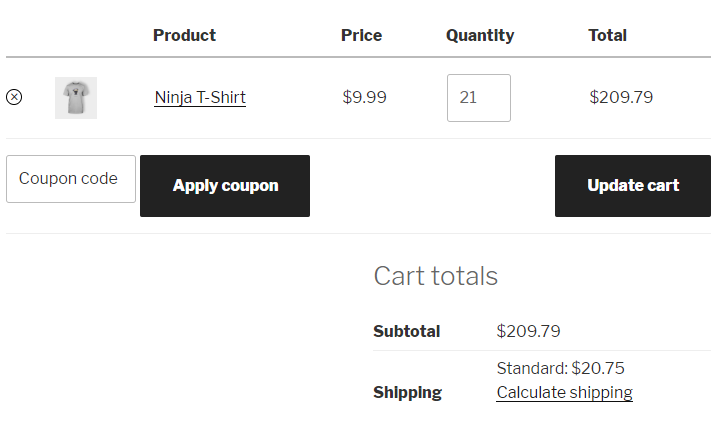 It will look through the rules for shipping method and see if it can match ALL the items in the cart. If it can it will calculate the shipping for that shipping method. If it cannot match ALL the items in the cart then it will ignore that shipping method and move onto the next one. It is very important to note it must be able to match ALL the items in the cart. It does this to make sure all items are eligible to be shipped via that method. For example if you had one bulky item that could not ship Overnight you would not want the Overnight shipping cost to be calculated. Now we can actually set up the rules. This is where the main parts of the shipping cost are calculates. As mentioned these rules represent the main part of the calculation. The rules are evaluated against the items in the cart. 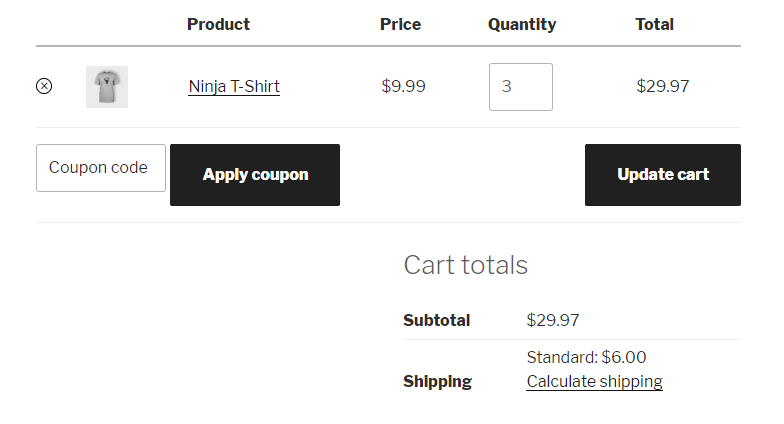 All the items in the cart MUST match a rule for that shipping method to be valid. If any item does NOT find a matching rule then a shipping cost will not be calculated for that shipping method. There are some examples later in the document that will help illustrate this. This is a very interesting rule. Basically if this rule is matched the plugin will immediately stop checking the rest of this shipping method and use the calculated shipping from this for the entire shopping cart, You can use this in instances where say you have a heavy product that ships via freight, you can include any other products in that shipping cost as the freight charge will cover it all. There will be an example later showing exactly how this works. Let’s run through some examples which will help illustrate how this works. Using the example above you may want use that calculation, but once you get past say 20 t-shirts you can start to offer a discount. Now let’s extend the above example. Let’s imagine your store has an item that is bulky and requires special shipping. Sometimes your customers just buy a bulky item, sometimes they buy bulky items and other items. The next example will make use of the STOP! feature. In this scenario imagine your store ships a lot of items but you also have one or two items that are big and bulky and need to be shipped via ground courier or some other mechanism. When you use the ground courier you can add any other items the customer has purchased for no extra cost. The rule for the T-shirt (2nd rule) should be relatively straightforward. The 1st rule is a little more detailed. What this rule is saying is if you get an item in your cart with the “Freight” shipping class then charge a base amount of $99 shipping. Also STOP – do not do any more calculations and use that value. In addition you’ll notice the “Label” field also is populated with “Special Delivery” – this will replace the usual text of “Standard Shipping” (that we set in the “Method Title” field).